Here at our poolside jewelbox, dishes as simple as grilled wild-caught fish and as decadent as housemade pastas speak to us. So do crafted cocktails. In the land of perennial sunshine, we can’t help but dive into our fresh supply of colorful produce to revive the classic American and European cuisine we love with a lighter touch. Our eclectic menu is paired with a boutique wine list and 1950s inspired seasonal cocktails. Join us daily, inside and poolside on the heated patio for lunch and dinner, weekdays for breakfast, and weekends for brunch. Our newly remodeled private dining room suits smaller cocktail parties of 25 or seated celebrations, from dinners to brunches for 15. 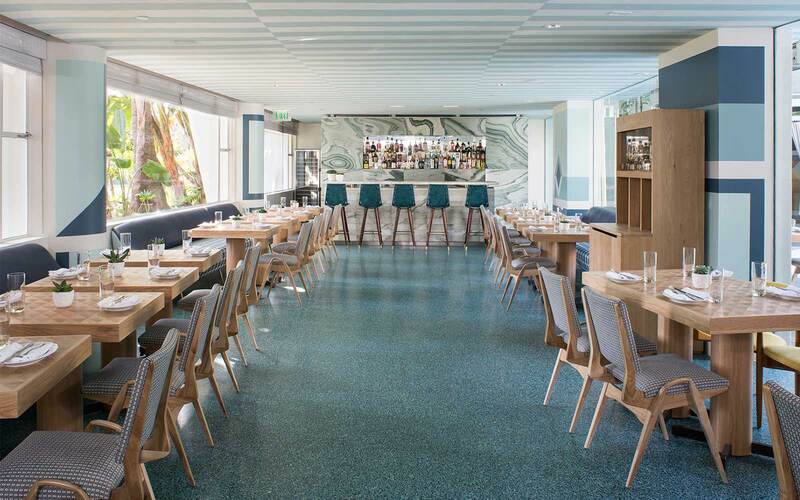 This space is discreet enough for business without missing the cool poolside atmosphere. We’re approachable, so don’t be shy about finessing to impress, or sharing your dietary concerns. Raised in a farm community in Ventura County, Michael developed a profound respect for organic produce and sustainable farming methods early in his career. A graduate of the Culinary Institute of America in New York, Michael’s accomplished career includes executive positions with The Modern in New York and the Michelin-rated Sona as well as famed Osteria Mozza in Los Angeles. In addition to his duties as executive chef For Viviane restaurant, Michael is also the executive chef/co-owner of critically acclaimed Poppy + Rose. A sophisticated, low-key setting for all manner of Los Angeles social gatherings–whether your guest list is 5, 50, or 250. Centered around a boomerang-shaped pool with private cabanas, Avalon Beverly Hills’ flexible events spaces are indoor/outdoor, hidden for privacy or right in plain view on the patio. Immersive technology, turnkey planning and curated menus are only the beginning. It only depends how you want to define your quintessential L.A. experience.